Home for Trainers - 13 Gloss Up Glossaries! This webinar live webinar took place on June 25, 2015. Click here to register to view a recording of this webinar. Non-NCIHC Members: $30.00 Fee waived! in celebration of the second year of the Home for Trainers - Webinars Series! Approved by CCHI for 1.25 instructional hours. 2. Provide the verification code mentioned at the beginning of the presentation (if there is one). Please email requests for certificates of attendance to [email protected] and indicate that you are requesting a certificate in the subject line. Every effort will be made to provide certificates to individuals who meet eligibility requirements within two weeks of their request. Glossaries are usually viewed as reference tools for interpreters and translators. However, the process of creating a thematic bilingual glossary is an effective method of acquiring new terminology for adult learners. Teaching interpreters to create bilingual glossaries accomplishes several goals, including developing their critical thinking abilities and terminology research skills as well as improving their understanding of equivalency of meaning. We’ll discuss how to incorporate creation of glossaries into interpreter training. Natalya presented the topic in a very well balanced theory-practice approach. She touched most aspects and challenges the interpreter faces when researching terminology and offered a systematic way to creating reliable glossaries. Thanks for the great Webinar! I really liked the idea of utilizing the mind-mapping system of Tony Buzan to help me with associating and remembering new terminology! Natalya Mytareva, M.A., CoreCHI™ is Managing Director of the Certification Commission for Healthcare Interpreters and one of its founding Commissioners. From 2000 to 2013, Natalya was Communications Director at the International Institute of Akron, a non-profit refugee resettlement agency in Ohio. She is the author and instructor of several courses for interpreters of languages of lesser diffusion. 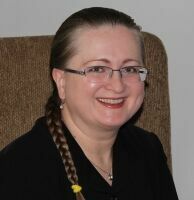 Natalya is a Russian interpreter/translator, and started her career as instructor of various interpretation/translation courses at Volgograd State University (Russia) in 1991. She holds a combined BA/MA degree from VSU in Philology & Teaching English as a Foreign Language.